We need replacement water filters for our refrigerator. After researching prices online, we decided to purchase the GE SmartWater MWF Refrigerator Water Filters through Amazon . They offer packages of 1, 2, 3, 4, or 6 filters at different prices. 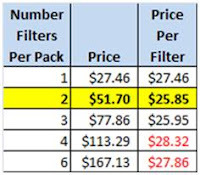 We previously purchased a 3 pack from another online vender and were going to simply buy a 3 pack again when we decided to quickly check the price per filter to make sure it's the best deal. At first glance, I assumed we'd get a better bargain the bigger the pack we purchased. However by checking the Price Per Filter, you can quickly see that you’ll get the best price by purchasing the 2-Pack. Interestingly, the 4-Pack and 6-Pack are actually more expensive than purchasing 4 or 6 1-Packs! I'm so glad we did some quick math...we’ll definitely be purchasing the 2-Pack of filters. I’ve also noticed this same questionable pricing before in grocery stores. Sometimes a larger size or quantity doesn’t always mean it’s a better bargain than a smaller size. So the lesson is to be a savvy shopper by checking the unit price of items you wish to purchase. Although I often buy in bulk it’s important to remember, more does not always make a better deal! Luckily you don't have to be a math whiz to check unit prices, many stores show unit price right on the price labels displayed on the shelf. Happy Saving!